Spray the pan with cooking spray. Saute the spinach in the pan you will use to cook the egg. Cook until it wilts on medium heat. 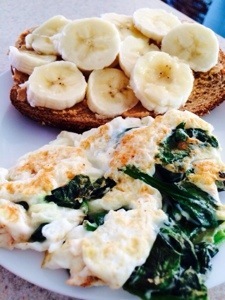 While it’s cooking, separate the egg whites, toast the bread, and cut the banana. Pour the egg whites over the spinach and stir around with a spatula until it’s cooked how you like it. Spread the peanut butter on the toast and layer the banana on top. Serve with a small glass of almond milk…and coffee, of course. You’ll notice the shimmer of the Christmas tree is gone. Time for real life.